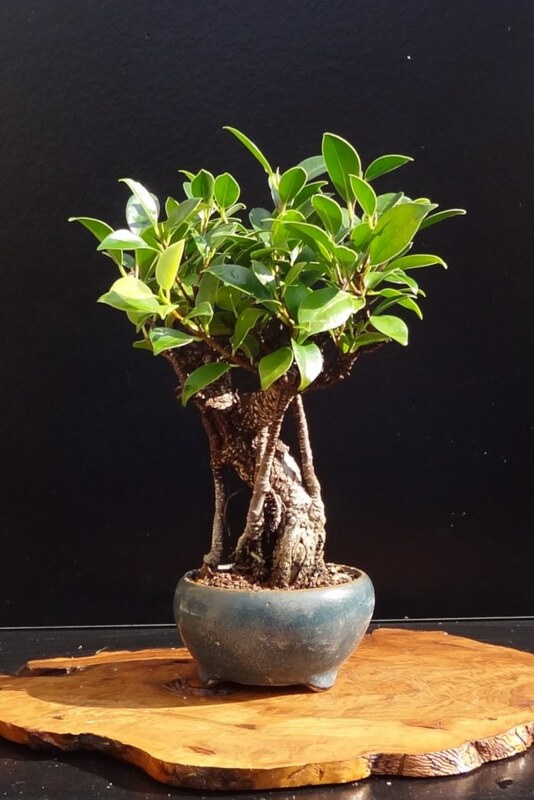 Ficus microcarpa is a small, easy bonsai often found in DIY or house furniture stores. It is great for growing in any home and doesn’t require any complicated follow-up. This plant will do great both in nice living rooms and in cozy bathrooms, as long as it gets light and proper moisture. Your Ficus microcarpa will do great indoors. Temperatures hovering around 60 to 70 or 75°F (15 to 25°C) are perfect if kept all year round. A lot of light will help, but not direct sunlight during the hottest hours. Indirect light is best. Ficus microcarpa doesn’t like being moved around, so once in a good spot, leave it there. Gusts of wind and drafts will lead to leaves falling off: keep it protected and out of corridors and hallways. Repotting your Ficus microcarpa is essential, every one to three years. Once a year is perfect, and you can pair it with trimming, defoliating and pruning to slowly create a majestic, elegant bonsai. Ensure excellent drainage (drainage layer made with clay pebbles or gravel, drainage hole under the pot, clean sand in the soil mix). Repotting ensures nutrients in the soil are replenished. It’s also a way to monitor root growth and check that the potting mix won’t lead the plant to rot. Clear roots that have passed through drainage holes to ensure water flows freely. This is a plant that naturally thrives in moist, humid climates. In ideal moisture conditions, it would even send out aerial roots, taking on a look similar to that of the banyan tree. Ficus microcarpa also goes by the name “Chinese banyan tree” to prove the point! No set dates here, a literal “rule of thumb” applies: stick a fingertip in the soil down to the first knuckle, and if it still feels moist, don’t water yet. Depending on the dryness of the air, this could be once every three to four days up to every ten days. Having found ways to increase air moisture will help the plant cope with irregular watering. Don’t let water collect around the roots. Let it drip until dry before putting it back on its saucer. Growth and vegetation slows, so it needs less water. Water at most once a fortnight. Don’t use cold water straight from the tap. Pour some in a quart or jug and set it near the pot for a few hours with the cap open. This will help vent out any chlorine and raise the temperature to avoid thermal shock to the plant. 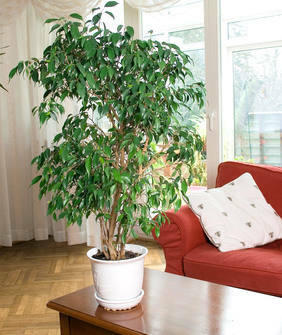 Bring your Ficus microcarpa to the sink and gently spray soft water on its leaves from time to time. That’s the perfect treat! Use a soft square of cloth (preferably cotton) to remove dust and traces of insects from time to time. A good size cloth is a square as wide as your hand. Wrap the cloth around the hand with your fingers so the falling tips won’t catch on branches. Other techniques to increase local air moisture will help, too. They’ll spare you from having to mist too often. Ficus microcarpa can grow huge in the wild in tropical climates, but in your house you want it to remain a smallish bonsai for best effect. Ficus microcarpa has the capacity to sprout new sprigs directly from the bark of the trunk. Thanks to this, you can’t make any “mistakes” when pruning! There are two ways of keeping your Ficus microcarpa under control. Choose whichever suits you best! 1. Constant pruning means checking on the plant often and removing twigs and growth that doesn’t please you. Every time you count up to ten new leaves, cut sprigs back, removing four to six new leaves in the process. This will force the Ficus microcarpa to produce new twigs and leaves. Try to balance growth to keep the plant covered all around, like an umbrella atop the root trunk. Rotate the plant to even growth out every time you prune. Only prune as leaves grow. If the plant isn’t making new leaves, don’t prune. 2. Seasonal pruning means only checking on the plant once or twice a year. Pruning is heavier. Spring is when you can go heavy on the pruning. Cut branches back by a third or even half. If you dislike shoots that may be sprouting from below the graft joint, cut them off as entirely. Seasonal pruning is more suited to Ficus microcarpa trees that you’re training into a bonsai with wires. Feel free to defoliate (or remove the leaves) upon pruning. New leaves will grow back, don’t be afraid! 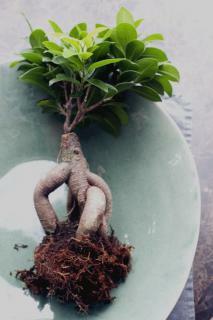 Ficus microcarpa naturally grows thick, juicy roots – leading to another common name, the “pot-bellied ficus“. However, these roots start off growing underground. To reach root sizes of one to two inches (3 to 5 cm) across, it takes the plant a year or two. At this point, the tree itself may have grown a stem several feet tall, also an inch across. When preparing the usual “Ficus ginseng” bonsai, each Ficus microcarpa plant is pulled out of the soil to expose the roots. The long, spindly stem is cut off just above the thick bunch of roots. grow gray-brown bark to protect the parts that were exposed, thus producing the “thick trunk” sought after for bonsai. From the cut trunk, new side branches will sprout for non-grafted specimens. These tend to grow straight out to the side and are very horizontal. These may be easier to train or guide into structured, elegant bonsai. To counter this effect, often older branches from discarded tops are grafted at the cut mark. They shoot upwards from the graft, giving the tree a more “umbrella-like” appearance. It usually looks less cluttered and nicer. Bonsai Ficus microcarpa grown this way are easier to maintain. When pruning, you’ll always have to choose between letting sideways-growing side shoots come out from the trunk, or keeping upwards-facing graft branches as the main, structural branches for your Ficus microcarpa ginseng bonsai. The latin name “Ficus” stands for “fig”. So the Ficus microcarpa is basically a fig tree! However, the second part of the scientific name, “microcarpa”, translates into “tiny fruit”. This particular Ficus species thus bears tiny fig-like fruits. They’re rare and only appear when conditions are just right, but when they do, they’re very cute! 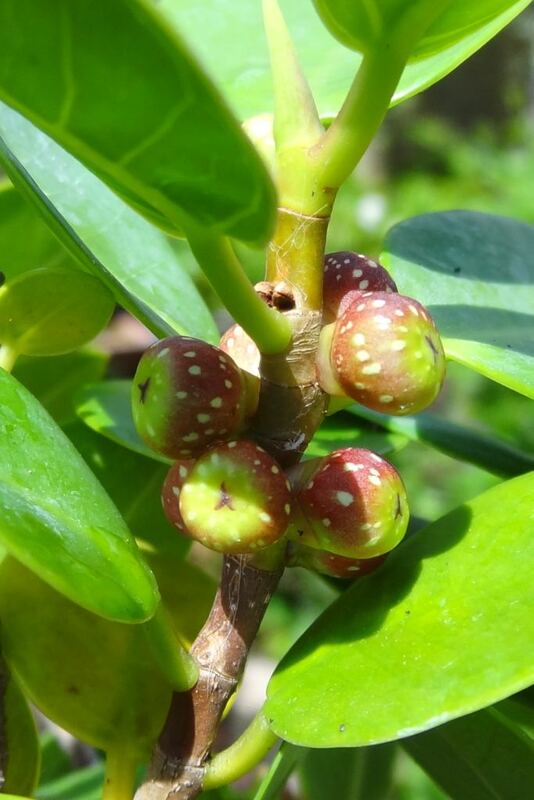 Ficus microcarpa fruits are at most half-an-inch across (1 cm) in size, and start out green before maturing to red and black. They aren’t edible for us but birds love them. Interestingly the fruits are only fertile if visited by a single specific “fig wasp” insect. If this special wasp isn’t found in your area, or if your home doesn’t let bugs in easily, the fruits will grow but the seeds are barren. This is actually a good thing because, in the wild, this plant tends to become invasive. It has actually been listed as an invasive species in Florida, in the United States. So far, the wasp (Eupristina verticillata is the scientific name) hasn’t spread much outside its native Asian range, except for the Americas. There are dozens of Ficus microcarpa varieties. They differ in leaf size, leaf shape, leaf thickness, bark color…Nature is very inventive and breeders have noted many appealing variations. Ficus microcarpa ‘Green Island’ – small very round leaves about an inch (2.5 to 3cm) across. Very well suited to bonsai growing. Ficus microcarpa ‘Green Emerald’ – small neat pointed-oval leaves about an inch and half (3 to 4 cm) long. Very well suited to bonsai. Ficus microcarpa ‘Tiger bark’ – beautiful patterns appear on bark and on roots that are exposed to air. Also well suited to bonsai growing, though the nice bark patterns fade away with age. Ficus microcarpa ‘Moclame’ – leaves are shaped like figs (!) or drops with a rounded tip, and grow at close intervals. This it best grown to a mid-size houseplant from 1 to 2 feet tall (30 to 60cm) with a tree-like stem and bushy leaf ball. Stems can be woven or braided easily. Pests that attack Ficus microcarpa are common houseplant pests: scale insect and spider mite essentially. Ficus microcarpa leaves brittle and falling off – not enough watering or too much wind in that spot. Ficus microcarpa leaves turning yellow and falling off – too much watering and/or poor drainage. Let soil dry before watering again, check drainage, and add sand or cactus soil mix to the potting soil. Ficus microcarpa is native to Southern China and the islands of Oceania, but its success as an easy houseplant means it now spans the world. 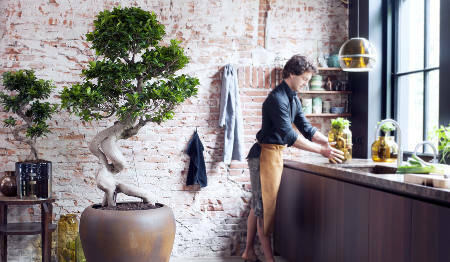 A relative of the common fig tree, this Ficus is particularly well suited to bonsai. Beginners appreciate it because it grows fast, is easy to train, and is very forgiving if you forget to water it or care for it at times. If properly watered, it won’t die on you on a whim like other, more fragile bonsai plants! Growing it in moist and warm environments will trigger aerial roots which make for a great addition to a plant pot composition! This species is quite common as a bonsai, and there’s a trick to telling it apart from Ficus benjamina, another favorite houseplant. Simply look at the tips of leaves: sharp, pointed leaves belong to Ficus benjamina, whereas slightly rounded tips are those of Ficus microcarpa. At times, a sister species called Ficus retusa is mistaken for microcarpa, and stores often sell one for the other, under the name Ficus ginseng! Like all other ficus plants, this species can fuse its trunks together. If you want to grow a thick bonsai fast, wrap thinner stems together and within a year or two they will have grown into a single wide trunk!